Pulp. I just love Pulp and one song will come to that desert island when I’m famous enough and I think it’s probably gonna be this one. 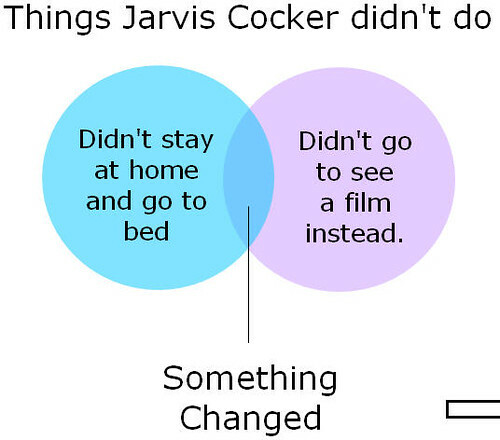 Oh Jarvis. Where would I be now? Where would I be now, if we’d never never met? Would I be blogging this song somewhere else instead? And I’m blogging it not just cos I love it, but also cos I’m just tired of seeing that Willingham woman stare out from my blog. *shivers*. This is for you Dan… it could be the story of my/your life. Which glass for you at the end though?